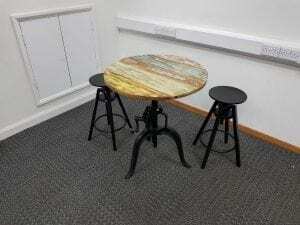 We are really fortunate to be able to offer you these trendy Interlink Sas fundos cafe tables; black height adjustable (by crank) metal base with distinctively coloured tops made of solid mango wood. Diameter: 740mm. 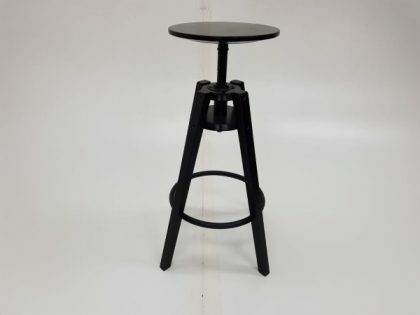 We also have some matching height adjustable wooden stools in stock. If you would like some more information about these products, or, if these products are not exactly what you were looking for, you can get in touch with our sales team by calling 07944 508282 or click on the telephone at the bottom of the page. Otherwise, simply enter your details into our ‘Request a Quote Online Form‘ below and one of our sales team will be in touch very soon. Obviously, these tables can be viewed in our showroom, along with all our other used office furniture.